The city of Madison wants to run completely on renewable energy. As Metro Transit currently accounts for almost a fifth of the city government’s energy use according to a recent study, electrifying the bus fleet could play a significant part in reaching that goal. It helped that Metro was recently awarded a grant enabling it to purchase three electric buses, a first for Wisconsin. The buses are expected to start operating in 2019. Beside emitting less noxious exhaust fumes, electric buses can be much quieter than diesel-powered buses. A major problem has been cost, especially given the current system that externalizes the real costs of all kinds of pollution. Hence, when Metro was awarded federal stimulus money back in 2009, it purchased 18 hybrid buses. Three years later, when it was again awarded (State of Good Repair) money for buses, but denied its request for the additional amount needed to upgrade them to hybrid, Metro bought diesel-only buses. At that time, a diesel bus cost around $367,000, a hybrid bus over $500,000 and an electric bus close to a million dollars. 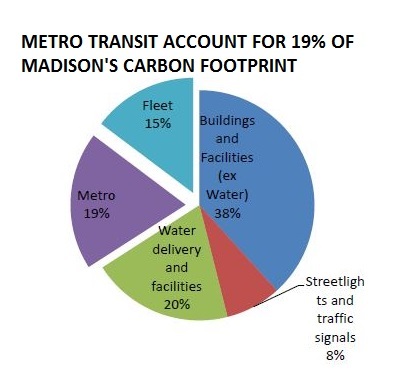 For all the hype from many sources including the American Public Transportation Association and Madison Gas and Electric, Metro Transit never operated buses using non-renewable compressed natural gas. In the past, Metro has relied on a 80/20 capital expense split in which the federal government paid four-fifths of the cost of a new bus. Buying new buses with such a split has been occurring for years as buses need to be replaced after 12-15 years. The general rule of thumb is that Metro needs to replace about four or five buses every year in its fleet of over 200 buses. Given the present federal situation however, Metro reduced an expected expense split from 80/20 to 50/50; even that may end up overly optimistic. The cost of electric buses relative to diesel ones keeps declining. That decline may have now reached the point where electric buses have become reasonably competitive, especially when the cost of fuel is factored in over the lifetime of a bus. That lifetime is presumed to be 15 years, but electric buses are in reality too new for anyone to know with any certainty. They have fewer moving parts than a diesel bus, and the maintenance is easier. Indeed, one now sees forecasts that by 2030, 84% of bus purchases globally will be for electric ones, compared to only 28% for the purchase of electric automobiles. There are many features to a bus beside whether or not it runs on electricity of course, and there is good reason to be suspicious of vendor claims. For instance, the Proterra electric bus is being touted widely, at the behest of a vendor or at least by media uncritically parroting vendor claims. That touting not only alludes to zero emissions, but also to efficiencies. However, analyses of the impartial Altoona Bus and Testing Research Center of Pennsylvania State University produce a less rosy assessment. The batteries might be less expensive, but if they are also unreliable and result in passengers either missing connections or having to shuffle onto replacement buses when the batteries go low, are they really being competitive? Fortunately, Metro did not purchase a BYD bus; however, the brand of bus it knew could withstand the challenges of our topography and climate was unavailable when the electric bus purchase had to be made. It had to purchase a risky kind instead. What happens if that purchase ends up being plagued by “stalls, stops and breakdowns” as in Los Angeles? In that case, public enthusiasm for electrifying the bus fleet was taken advantage of by vendors. Such predatory vending could in turn engender a backlash that would make it more difficult to adopt appropriate technology when it is available and truly cost-competitive. Would having an electric fleet motivate more car drivers to leave their cars at home when possible, opting instead to use the bus? It is always amusing to hear car drivers here in Madison tout the importance of mass transit as a tool for tackling Climate Change while continuing to opt for driving themselves. 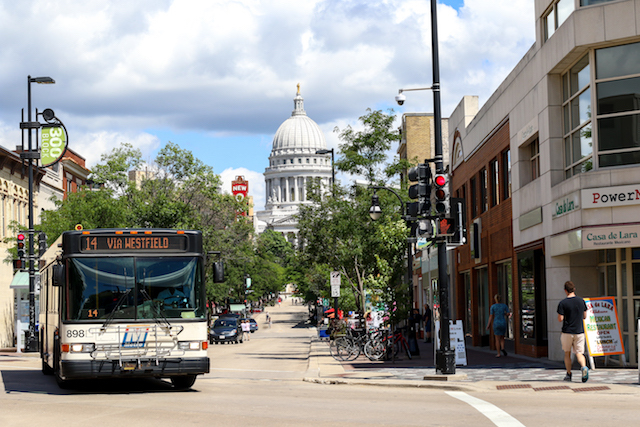 At the same time, many of Madison’s actual bus riders say they would prefer to drive cars if they could. The goal should be that everyone would prefer to use the bus over driving, and that it be an electric bus running on renewable energy. We have a long way to go.